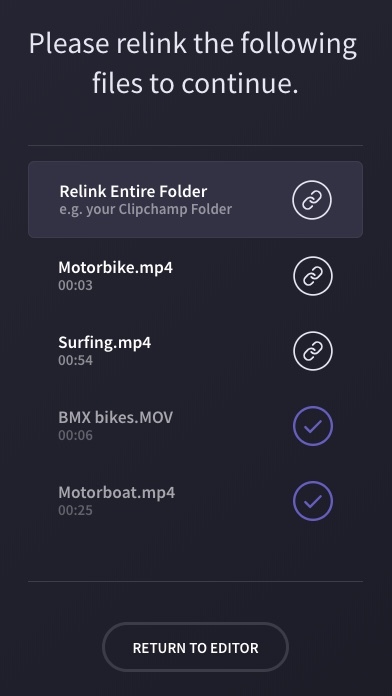 When you add video, image and audio files to your project, Clipchamp Create temporarily saves copies of these files in your browser cache. If the cache has been emptied, or these temp working files have been removed for some other reason (e.g. 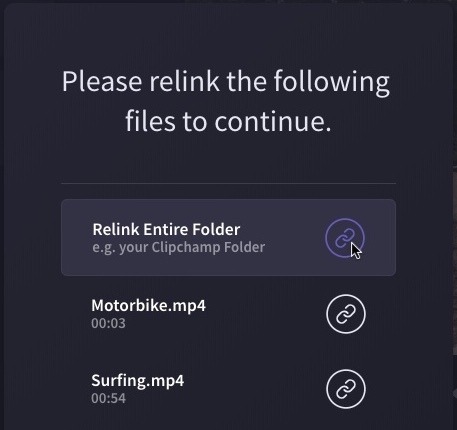 there is not enough space in the cache), Clipchamp might ask you to relink them from your computer's drive when you re-open the project. In the Popup that appears, click Relink entire folder. In the file search window, locate the folder with the original files and click Upload to connect them to your project again. Click Upload to continue and relink your files (Create will only add the relevant files to your cache again, not other files in the folder). Once all files are relinked, the window will close automatically. If you would like to go back to the editor without relinking all files, simply click Return to Editor at the bottom of the window. What if I can't find my files? Create is fast and private because it does not upload your video, image and music files to an online location for processing. Your files always stay on your computer, and we do not have access to them. This does, however, mean you have to keep your original files, and if you've lost them we have no way of retrieving them for you. If you've deleted them, we suggest retrieving the files from your original source – e.g. many smartphones keep backups of deleted videos for a certain number of days. 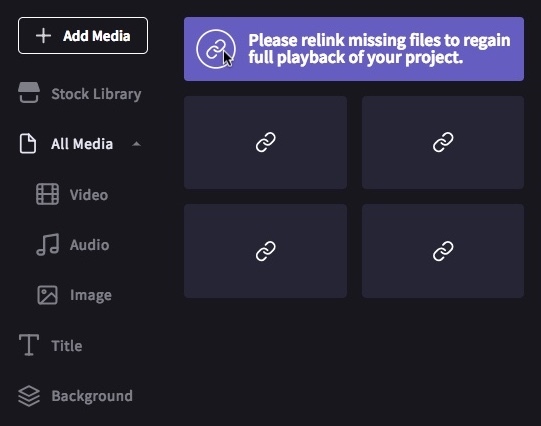 If you've used stock videos and audio in your project, you don't need to worry about relinking. These files are always available. If you have added an unsupported file type this can sometimes cause problems with re-linking. If this happens we suggest reloading the page, or logging out of Create and logging back in again, then attempting to reopen the project. Can I work on my project on another computer?